Enjoy the security of a GUARANTEED income!! As the only Hibernian Securiclean™ Management Franchisee in your area you’ll make a healthy profit inside 12 months. If you like the idea of working for yourself, enjoying being an effective manager and decision maker and want to build a successful business through high quality service, then this Management Franchise might be for you. The Business – At Hibernian Securiclean™, we provide Ireland’s highest quality professional commercial contract cleaning service. Our market is constantly growing, with Ireland’s strong economy more and more businesses are seeking high quality regular contract cleaning. The cleaning business is virtually recession proof and as the old saying goes “where there is muck there is brass”. This gives great security and longevity to our business (and to you as one of our Management Franchisees). As a result of this phenomenal success we’re getting demand from all over the country that we simply can’t handle. That’s one of the reasons why we’ve chosen to franchise our business. – the opportunity for you to be the sole provider of our unique service in your exclusive area of the country. You will operate a business, which has the highest rate of Customer referral in the industry. Delivering a fully supervised service of such high quality, you will soon grow a fantastic reputation in your area. And what’s more you’ll have fun doing it. 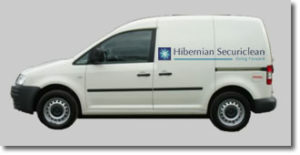 You’ll be amazed how much business you get just from people seeing Hibernian Securiclean™ Vehicles. You will be your own “boss” in charge of your own destiny with the freedom to prove your own worth. As this is a Management Franchise you will be energetic, industrious and have a huge hunger for success. You will also be commercially astute with good business acumen and pay close attention to detail. As your business expands, you will recruit and train a team of staff and progressively, with our full support, build up to a large multi-vehicle operation. We have time tested and proven systems that help you every step of the way. From setting up in business, to recruiting and training high quality staff, to getting customers and work- even systems to help you maintain the bookwork! Please Note: We are a Successful 100% IRISH Owned Company. Why You Should at Least Contact Us For An Informal Chat…. Here are 8 notable reasons (there are many more in the downloadable Mini Prospectus) why you should consider The Hibernian Securiclean™ Management franchise. World Class Marketing Systems: No other commercial cleaning company in the whole of Ireland has anything remotely comparable. Be it via the internet, telephone directories, leaflets, newspapers etc we are getting fresh inquiries on a daily basis. Dedicated Sales Person: We have a dedicated professional sales person devoted to following leads and generating new business for new franchisees in their areas. Large Exclusive Territories: We will only award 9 Management Franchises across the country. So Unlike some franchises in Ireland, our franchisees have very large territories, each with a population of around 300,000- so you can keep growing your business year on year. Fulfill Your Potential: This is a chance to build your own business but with the security of a proven format and complete support whenever you need it. This will allow the right people to fulfil their business potential, whatever their background. And of course that also means good earnings year after year, giving you the lifestyle you deserve, and the opportunity to enjoy it. People Want What We Offer: The service we provide is in high demand- and the market is growing. To give you an idea of how large a potential there is, of your territory’s 300,000 people, you only need to have as few as 6 contracts per year to meet the returns we forecast. Proven Systems: Truly brilliant systems that make you well on the way to being an expert when you leave the training course. We’ve spent 45 years perfecting these and now we‘ve systemised them with the help of IFMC to ensure that the right franchisees can replicate them across the country. You’re Never Alone: You get a support structure that ensures you’ll always have someone to turn to. From the MD of the company through to your franchise support director everyone is focused on your success. Quick Return on Investment: Your franchise fee is paid back in most cases within 12 months- which is very unusual in franchising these days! Who is the ideal Management Franchisee? We need people who are energetic and personable, with good business acumen, with good operational passion and ability and who can deliver on all promises like effective managers do. We need people who enjoy talking to Customers, who feel that creating and building a successful business is part of what they are. People who enjoy a challenge. People who want a lifestyle their skills and commitment warrant. But most importantly, people with the drive and determination to build their own successful business. If you like what you’ve read and you qualify, get the full facts in our Mini Prospectus by clicking here. We know you’ll want to weigh up your options. So all I’m asking you to do is to come and meet with us. Complete the on-line enquiry form by clicking here. We can then arrange your FREE no obligation meeting. But you must be quick because our Management Franchise territories are exclusive and we only have 9 – so when they’re gone – they’re gone! I look forward to welcoming you into our growing and thriving business.